An important thing to do when visiting towns is connecting with the folks who know their cities really well. I’m not really interested in eating at restaurants listed on “Top 10 Lists” created by someone who doesn’t even leave their desks to write them. In this case, I was in Memphis which means I spoke to my bud Seth at the Best Memphis Burger blog. He directed me to Roxie’s Grocery and asked me to read his post before checking it out, which I suggest you do also. I also need to agree with him on the Faygo, I’ve never so much Faygo in my life. It was beginning to rain when I arrived and there were a couple of fellas hanging around outside on what seemed like watch duty. I made my way into the grocery and straight to the back where the kitchen area is. I didn’t have much time to thoroughly think out my order and when it became my turn I blurted out 2 Cheeseburgers with Cheese Fries. I really wanted Chili Cheese Fries but I never corrected myself. The older lady running the kitchen was berating one of the line cooks like an angry Mom talks to a child who ignores all her demands. It was brutal to watch and all of us waiting for our food just turned our heads in embarrassment for the poor guy. Before I knew it the Burgers were done, I grabbed a couple of Cokes, paid and was out the door. The rain had picked up a little more by then but my wife Marcela was in the car right around the corner. I jump into the passenger side (over a large puddle) and with extreme excitement open up my styrofoam container to see this bad boy up close. They were beautiful hand pattied and deformed Burgers. I removed the offending LTO on the bottom and could finally dig in. Wow, just wow! The Burger itself reminded me of Ann’s Snack Bar in Atlanta. 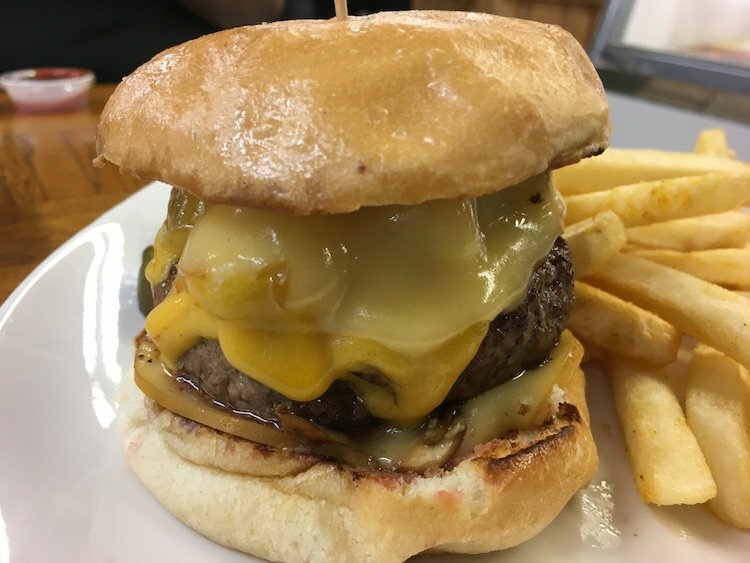 The American Cheese was melted all over and as I took bite after bite I was hoping it would never end. It did end of course and then I just sat there and popped some of the Cheese Fries in my mouth. The Fries were seasoned and pretty good but no match for that Burger. Let me just put it to you this way, next time I’m in Memphis this will be my first AND last stop.